Will not warp, dent, chip, scratch or break. They're a little bit heavier than the tin ones, but they sure bake up a perfect loaf of bread. I bought a pair of these recently, but not the set with the pie pan included.. I use the cast iron pizza pan under them to speed up heating the iron bread pans... I have to reduce the baking recipe time just a few minutes to prevent over browning the crust though. Very satisfied. My daughter and daughters-in-law have been taught to use cast iron and how to care for it. This was an item I didn't have in my collection so in purchasing one for me, I decided it would make excellent gifts for them. They are so excited to get a gift of cast iron. For their birthdays this year they are getting the biscuit pan (with the seven biscuit bakers in it). I have one and love it. As for as I am concerned...you can't good cast iron for cooking...especially that made in the USA. We love these pans. Our breads come out tasting like childhood memories. 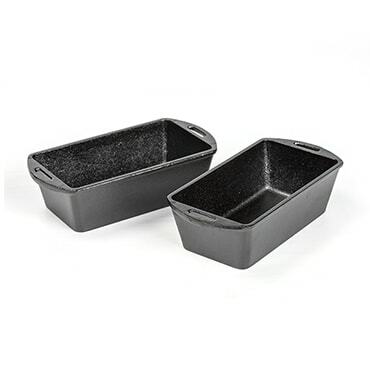 I was so excited to see these bread pans on line and could hardly wait for their arrival. I've used them a couple of times since then and they are wonderful. I would highly recommend them to everyone. I love cast iron anyway. It cooks so evenly. 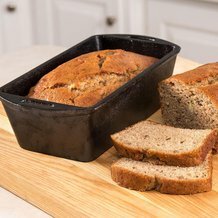 I'm always making fresh bread and I love the way it cooks in my new bread pans. We are ardent users of, the original nonstick, cast iron cookware including Dutch ovens, skillets, woks, griddles, wedge pans, pie pans, and now bread pans. Nothing puts a nice crust on bread better than cast iron and when seasoned bread just falls out. Our collection of cast iron cookware can be passed on to our great, great, great, ... grandchildren. If you're serious about bread making then get serious about your bread pans!